Acupuncture is a wonderfully natural system of healthcare which can bring about lasting improvements to our health. It can be a very positive force for change and helps us achieve a more balanced way of living. Traditional Chinese Medicine (TCM) is based on the philosophy that vital energy known as ‘Qi’ (pronounced chee) runs through the body just as rivers flow across the earth. The Qi flows through channels known as ‘meridians’, each one corresponding to a different organ. Qi consists of equal and opposite qualities or forces – Yin and Yang – and when these become unbalanced or the energy flow is restricted in some way, illness may result. 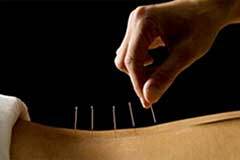 Acupuncture involves the insertion of fine needles into specific points along the meridians. This helps to encourage and manipulate the flow of Qi by unblocking and moving, or by redirecting the Qi to where it is needed most. This approach can restore the healthy functioning of the body and lead to a more permanent resolution of the problem, even when western medicine hasn’t been effective.